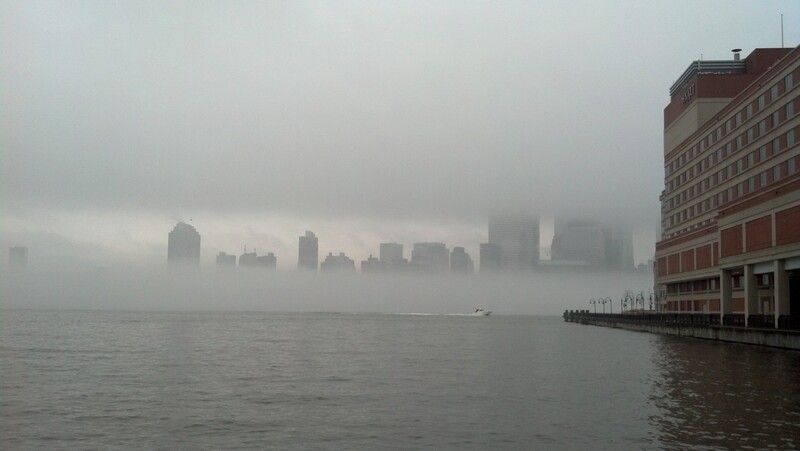 Strange mist earlier this week obscuring the Manhattan skyline. How can I describe it? You close your eyes and try to remember the first snow this season as it fell softly on your way to work. You relive the memory of your train ride from Calcutta to Kharagpur where you met the woman who shared aloo parathas with you. You feel the taste of the exotic Ghost Pepper at Chelsea Market in Manhattan on your tongue, after you’re home, when the burning sensation is no longer real. Then you simply describe it in words. Description. Of all the strategies of writing, description should be the easiest of all. I mean, after all, what’s there to description? The original is already in existence, or must have been in existence, or can be very much like something that is or was in existence. Just go forth and make a copy. Describe it. Can that be so hard? Turns out it isn’t exactly that easy. Granted, to some of us, description comes more easily than others. I find it extremely difficult to remember numbered lists but ask me to remember a scene and I will describe it in minute detail. Take a grocery list, for example. Ask me to memorize those items and reach the store and my particular kind of descriptive memory will make itself visible. Quite literally. I’ll remember the paper or screen, the handwriting, the time I sat down to write it, any unique smudges or marks, even the exact corner of the sheet on which the list was written. But inevitably, ask me to remember the numbered items and I’ll be tortured with a sense of what was there and is missing from memory. But if my favourite brand of potato chips was a part of this list, it’s unlikely that I’ll forget. However, that won’t be because it was an entry on that list. It will be because the golden, perfectly fried chips, the grains of salt as they melt on my mouth, the cool, smooth feel of the plastic packet in my memory will drown out other sensations in the present as I’m walking out that door to the store. Hence, my kind of memory isn’t exactly an asset in many situations. There is, of course, the matter of mood. If I’m feeling particularly nostalgic, even the slightest of occurrences will trigger a flash of memory that could be very detailed. But if I wait too long to write it down, a different mood might take over and the particular event that ends up being described might be completely different–either a very banal version of my poignant remembrance or a completely different experience altogether that does not move me as much. It’s the same set of experiences on the reader’s part which makes the whole experience of communication between writer and reader through description so terribly complex. Your Facebook note about your grand vacation may have been exuberant, happy, factual, banal or sardonic depending on the mood you wrote it in. Yet, your banal might trigger my exuberance because I was reading your piece when I got the news that I topped my class or give way to my cynicism as I glance at your piece as I get the news that I lost my job. Such lack of control of communication of experiences might make us want to pin down description by simply making it more and more specific by using more and more words. But meaning slips away as words fail to represent exactly and the reader fills the gap with his/her own experiences. No matter how closely you describe a bag of chips, if the reader has never never seen your particular bag, he/she will fill that gap with his/her own bag that s/he got from his/her store yesterday. It does not matter how closely you describe it. Doesn’t that make you wish to do away with description entirely and simply tell the reader what to think like putting those items down on that grocery list? Fulfills the requirements of that list. Yet, something remains missing from that memory. Chips. Golden. Unbroken. Lightly salted. Heavenly aroma. Crunchy. One colourful bag. Smooth. Life is in the details. But it is sobering to be reminded sometimes that the details in writing don’t add up exactly to the details of life. So life will always remain more alive than writing. And description will always remain a copy. Nice article, enjoyed it. I always have to think about how much detail to put in (always have to cut back). Have yet to arrive at a universal ‘rule’ that can be applied in every case! Heavy description in prose always bogs me down. You’re right the reader will fill in the blanks. Wonderful insight. Thanks. Thank goodness the stuff of life is more than a shopping lis! And ah, that train ride! What took you to Kharagpur? That was where we lived. (See a story of mine about those early morning journeys: http://josna.wordpress.com/2010/03/22/pre-dawn-adventures/.) Back to your grocery list: the descriptive version made me smile (and my mouth water). It would take much longer to write, but one would certainly remember it longer.